Essential Oils have so many amazing health benefits. Essential Oils can be great for kids too! However, not all essential oils are safe for kids. Knowing which oils to use and how to use them, can be a really tricky thing to navigate. After doing a ton of research on safe essential oils for kids and how/when to use them, I introduced a choice few to my kids (via a diffuser). After about 6 months of use, the benefits are undeniable! Because we've had such a great experience with essential oils, I thought I'd share some of what I've learned. Read on for our Essential Oils for Kids Guide which includes information on which oils are safe + more on when and how to use them with kids ages 2-6 years old. 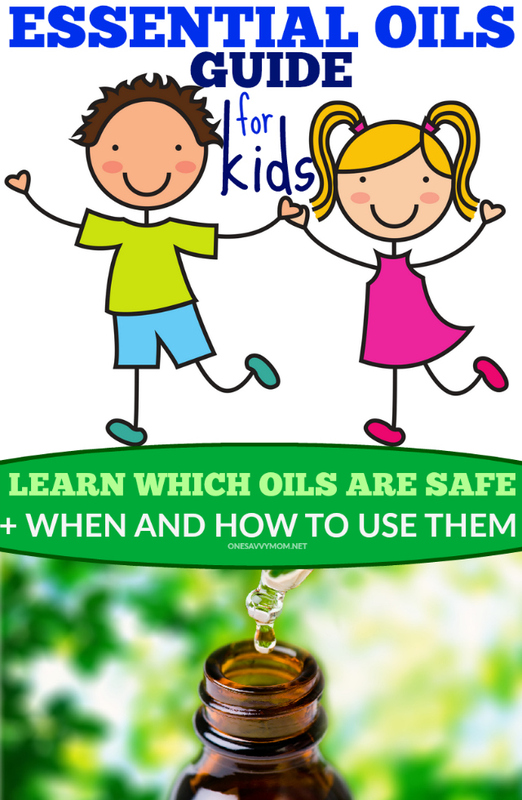 First, let's get to how to safely use safe/approved therapeutic grade essential oils with kids (ages 2-6). The only way to safely use approved essential oils/essential oils blends with kids in this age category, is to diffuse them. They should not be ingested or used topically with this age category (ever). To diffuse them safely and effectively, I recommend using an essential oils diffuser that has a water capacity of 200 ml. or more, such as THIS diffuser. Now, lets get down to which oils are safe. NOT all essential oils and essential oils blends are safe for use with children. So, please be sure to do your research before introducing anything new to your child. Some companies, such as Plant Therapy and Young Living make it a bit easier for parents by offering essential oils and essential oils blends that are specially formulated for children. So, if you're uncertain about where to start with essential oils, they are a great way to introduce essential oils to your child / to begin to glean some of the many benefits of essential oils with your child. 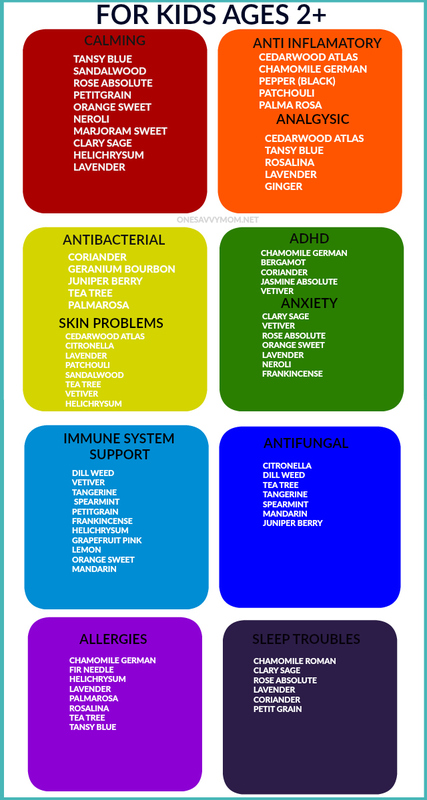 I've also compiled a quick reference chart (see below) of safe essential oils for use with kids ages 2-6. It includes some of the safe essential oils for use with kids along with their many uses/ health benefits including: calming, anti-inflammatory, antibacterial, skin problems, ADHD, anxiety, immune system support, anti-fungal, allergies, sleep problems. We have found therapeutic grade essential oils to be so incredibly beneficial in our home. Our entire family uses them, in one way or another. As always, be sure to consult with your family physician / pediatrician before starting any new regimen. ***Disclosure: The information in this article is not meant to substitute/replace the advice of a medical professional. Consult your physician before starting any new regimen. All opinions expressed are our own.